Solar panels are an excellent way of helping the environment, and they can also help home owners save considerable amounts of money over a period of time. On average, residential properties and businesses can save over 50% on their electricity bills by having solar panels installed. However, many households and businesses are missing out on the full benefits of having solar panels due to one simple reason – lack of maintenance and cleaning. Initially, solar panel users are delighted with the results that their solar panels produce. However, as time passes, they start to notice that the panels become less efficient, and start to save them less money. Often, this is blamed on ‘faulty’ solar panels, or solar cells ‘wearing out’ after time; but the reality of the matter is that the vast majority of solar panels simply need to be cleaned. Due to the tilt of the solar panel design, many solar panels are adversely affected by elements such as rainfall, bird droppings and dust accumulation. In a recent study by Google at their headquarters in California, they observed that once they cleaned their solar panels the efficiency of the panels instantly increased by 36%. So without hiring the help of regular solar panel cleaning services your solar panels may well be less effective. This could mean that you’re potentially wasting hundred of pounds a year by not maintaining your solar panels properly. 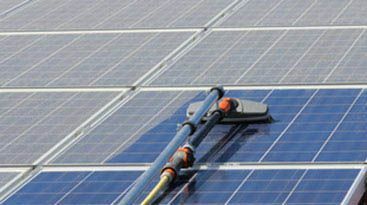 How Can Gleam Team Help with Your Solar Panel Cleaning? – Gleam Team are experts in solar panel cleaning St Helens area and all around the north west. We clean all solar panels using triple filtered, purified water, ensuring that the panels dry streak free. – No cleaning chemicals are used on the panels as they can be more corrosive and damaging which is not recommended. – We also use long reach brushes which means no roof tiles or panels are damaged in the process. What Can You Expect From Gleam Team? – A professional, consultative service. We listen to your requirements and we aim to offer you the most cost effective solution. – A team of experts. We will clean your solar panels efficiently and we have a courteous, friendly approach. – No mess and no hassle. We will leave your property without creating mess and with minimum interruption to your day. – Professional Equipment. We have a range of custom-made equipment for the job, ensuring that your solar panels are cleaned in the most effective way possible. You’ve invested money in your solar panels so make sure they are maintained appropriately, so that they continue working hard for you. So for maximum return on your investment, and to ensure that you keep saving money on your electricity bills, contact us today on 01744 333 002 or get a quick quote here. Gleam Team offer an iron clad guarantee; If it doesn't look like new you don't pay a penny!